A new twist to an old favorite this head is ideal for fishing swimbaits, ned rigs, a-rigs or any of your favorite soft plastics, with a wide variety of weights and hook sizes. This head matches up well with a variety of swimbaits to provide a natural profile. 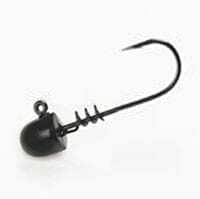 Gamakatsu 90 degree hook to penetrate quick, powder coated and baked for durability and is also equipped with a screw lock bait keeper that will hold your bait in place with no glueing, allowing you to catch more fish while using less baits. When using TRD plastics please use the standard dead head as these plastics do not perform well with the screwlock.